It’s true, Israel has this “nasty” habit of preventing Nuclear War, or at the very least preventing tyrants from having the opportunity of using nuclear weapons against the United States or their own people. They bombed Iraq’s program in 1981 and Syria’s in 2007. And if they have to they will do it again. 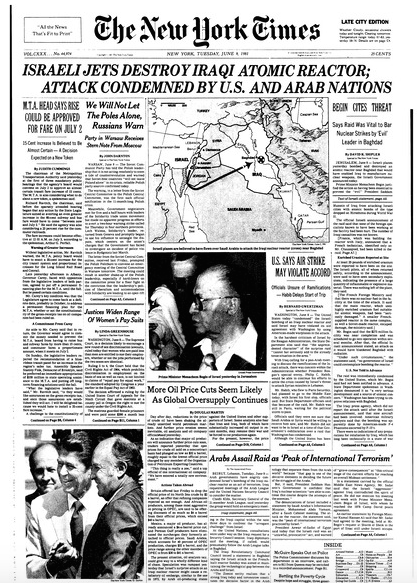 In 1981 the tiny nation of Israel executed a military plan which was roundly criticized across the world (including the United States). It was only with the hindsight of history that we can now say that Menachem Begin’s decision to bomb an Iraqi nuclear reactor may have saved the world from a Sadaam Hussein with nuclear weapons. Eight years ago we were told that SOMETHING happened in the Syrian desert. Israel was silent and Syria told a tale which changed more often than the IRS changes it’s tune about the tea party targeting scandal. First they said that the IAF dropped a fuel tank in the Syrian desert, then they bombed a strategic location, then they bombed a warehouse, then Syria said that there was NO Raid, blamed the US for the attacks, and they finally said the IDF bombed nothing important, just a construction site. It turned out to be a nuclear reactor. To do justice to both stories, we will break them up into two posts. Today Iraq! In the late 1970s, Iraq purchased an “Osiris class” nuclear reactor from France (some things never change). Israeli military intelligence assumed this was for the purpose of plutonium production to further an Iraqi nuclear weapons program. 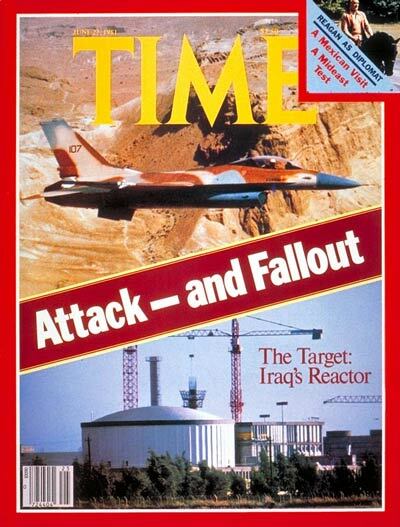 Israeli intelligence also believed that the summer of 1981 would be the last chance to destroy the reactor without exposing the Iraqi civilian population to nuclear fallout. After that point, the reactor would be loaded with nuclear fuel. Just like Iran today, Iraq protested that its interest in nuclear energy was peaceful, at the time Iraq was a signatory to the Nuclear Non-Proliferation Treaty (NPT), placing its reactors under International Atomic Energy Agency (IAEA) safeguards. Some experts remained unconvinced that the IAEA monitoring program was sufficient to guarantee that weapon research was not being conducted. They also claimed that an Osiris class reactor was not particularly useful to countries which have no established reactor programs, but that it was capable of producing plutonium. Israel first pursued a diplomatic solution to the situation. The villain of the Temple Mount and Israel’s foreign minister Moshe Dayan went to the United States for help. However, Israel failed to obtain assurances that the reactor program would be halted. In meetings with the Defense Secretary Casper Weinberger and Secretary of State Alexander Haig, there was agreement about the Israeli assessment regarding the Iraqi nuclear threat. American representatives even verified Israeli assessments that Iraq was working to reach nuclear capability and would exploit the ability to influence and destroy Israel. Despite the American consensus, the Americans refused to act, perhaps because they did not truly grasp the danger, or because they did not want to upset Iraq, then fighting America’s enemy, Iran. 4 pm, the evening before the Shavout holiday, 1981, orders were given to begin operations. At 5:35.a squadron of IAF F-16 fighter aircraft flew over Iraqi skies and dropped a number of bombs. The nuclear reactor was completely destroyed. Mission accomplished. One after another, the pilots shouted the code word “Alpha” into their radios, signaling their success. Zev Raz, Amus Yadlin, Chagi katz, Amir Nahumi, Yiftach Spector, Yisraeli Shapir, and Ilan Ramon- changed history, erasing the nuclear threat of the enemy. Iraq established a nuclear program in the 60’s and with the cooperation of the USSR built a nuclear reactor ten km’s southeast of Baghdad. 16 years later, Iraq began to broaden their nuclear programs and were supported by France who provided them with a nuclear reactor. The reactor consisted of two buildings, the “Tamuz” 1- the first reactor that produced uranium, and the “Tamuz” 2. The Israeli government convened to discuss the growing nuclear threat in that region. Israel was doubtful about Iraq’s claims that the nuclear program was for the benefit of its citizens. Their doubt increased when the IDF Intelligence Branch published intelligence reports that Iraq’s operations posed a real threat to Israel’s very existence- and Israel was forced to draw up plans to destroy the reactor. 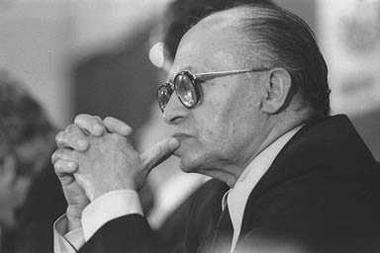 On the 14th of May, Prime Minister Menachem Begin, authorized the bombing of the nuclear reactor. Ezer Wiezmen, the then Defense Minister, opposed the operation and resigned from the government two weeks later. During a cabinet meeting the plan was formally authorized by Begin. “A large clock is hanging over us, ticking. Iraq’s intent to produce nuclear weapons poses a great danger to every man woman and child in the state of Israel”, the prime minister remarked. The plan was kept in complete secrecy. From the get-go it was understood that the most effective way to implement a successful mission would be one conducted by the Israeli Air Force. It was decided that the operations would be done by F-16 fighter aircrafts that the IAF had received the year before. An Israeli Air Force squadron of 8 F-16’s heavily armed, as well as a number of F-15’s providing air cover and fighter support would implement the mission. One of the primary focuses during the planning stage was which direction the planes would fly. (11,000 km each way), over hostile territory and with a limited supply of fuel dictated the flight path. The plan was set for the seventh of July, zero hour-30 minutes before sunset. The pilots that participated in the mission were selected for their impeccable flight records and were trained in secret and requested to implement the operations with no second thoughts. In the afternoon hours of the 6th of June, the plan was set in motion. All the members of F-16 squadron were called up for duty. On the morning of June 7th, 1981 8 F-16 fighter aircraft left Israeli airspace heading west towards the Tigris River, next to Baghdad. The flight to Iraq took upwards to an hour. Radio transmission was silenced. The Iraqis were caught completely off guard. 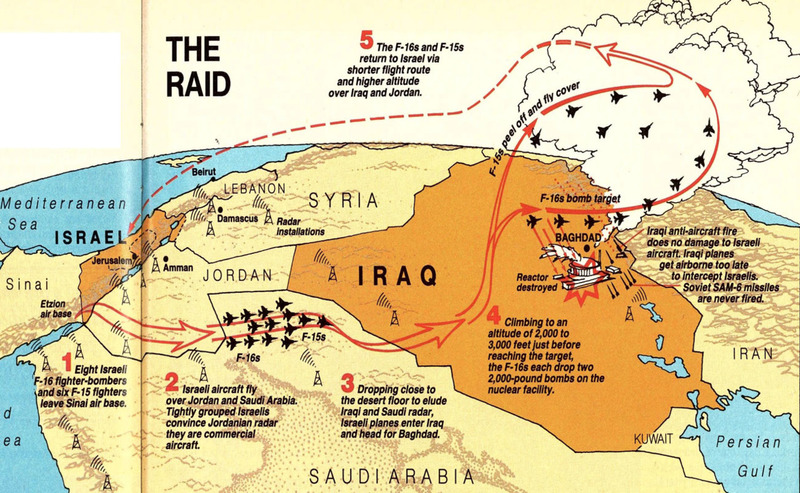 The Iraqi radar system was incapable of picking up on the impending danger. Major General Amus Yaldun, one of the eight combat pilots that participated in the mission and now head of the IDF Intelligence Branch, related, during an interview with IAF journalists, about the famous flight. “Each aircraft flew with three full tanks of gas, two air to air missiles and two bombs each weighing one ton. We flew in two groups of four. The first group was led by Colonel (res.) Zev Raz, the “First Jet” squadron leader, and the second group was lead by Brigadier General (res. )Amir Nehomi, commander of the “Northern Knights”. I was number two in the first quadroon. We headed south of the Jordon River, passing over the Saudi desert. We reached the Tigris River in a short amount of time. The blast of the first bombs echoed in the distance. One of them hit the center of the reactors roof. Once the bombs were releases, I felt the impact of the explosions shaking my plane. This was the end of the Iraqi nuclear reactor “Tamuz” 1.” The Israeli planes made a roundabout turn west, heading home. “The direction home was facing the sun as to prevent the enemy from following us. We received report of the second squadron’s attack on the reactor. We felt great. A- Because of completing the mission and B- Because all of us, the whole squadron, had come home in peace.”At the time, the attack was widely criticized. Israel responded that its actions were self-defensive and thus justifiable under Article 51 of the United Nations Charter. Critics rejected the idea of “pre-emptive self-defense”. France, in particular (again no surprise), was outraged over the loss of a French national as a result of the attack, and since the raid diplomatic ties between France and Israel have remained strained. The United Nations Security Council passed Resolution 487, calling upon Israel “to place its nuclear facilities under IAEA safeguards”, and stated that Iraq was “entitled to appropriate redress for the destruction it suffered”. Israel has not complied with these requests. The United States supported the resolution condemning the Israeli action — not the country as other nations tried to do. Their course of action was to withhold a contingent of aircraft already promised to Israel. “Weinberger says that he thinks Begin must have taken leave of his senses. He is much disturbed by the Israeli reaction and possible consequences,” Sir Nicholas cabled London. Britain’s ambassador in Baghdad, Sir Stephen Egerton, disclosed that the Iraqis had been just as surprised when the Israeli F15 fighters appeared in their skies. “The diplomatic corps had a ringside view of the belated ack-ack and missile reactions to the raid when we were gathered for the Italian national day reception on the Bund [waterside],” he wrote. Of course the UN General Assembly passed a resolution trashing Israel for saving herself. Over twenty years later when the world began to face a terrorist threat as never before the world began to realize the service performed by Israel, the IAF and Menachem Begin. Just imagine a world with Iraq or, God Forbid, a terrorist with their hands on a nuclear weapon. If it wasn’t for Menachem Begin, a Prime Minister with guts to give the orders to protect Israel, knowing (but not caring) that a world would absolutely freak, and the heroes of the IDF who flawlessly performed their mission, this scary world have happened already.For those who are still questioning PM Netanyhu’s reaction to Barack Obama’s P5+1 deal, remember what happened thirty-four years ago, and understand that Israel will do anything it takes, no matter what the world thinks, to defend herself. And if they do, eventually the world will say thank you. But it really doesn’t matter.